Good news for fans of the Dell Streak range: in addition to the 5-inch model there's a seven-inch Streak 7 and on the horizon, a 10.1" Dell Streak 10. The Dell Streak 7 isn't just a Dell Streak 5 with a slightly bigger screen, though: there are some interesting changes under the hood too. 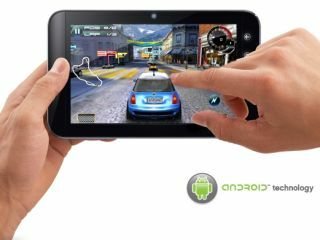 The Dell Streak 7 tablet gets a dual-core Nvidia Tegra and 3G mobile broadband together with the usual GPS, Bluetooth and Wi-Fi. The 800x480 screen is behind a sheet of ultra-tough Gorilla Glass, there are front and back cameras and there's 16GB or 32GB of internal storage with support for SD, MMC and SDHC cards. The front camera is a 1.3MP fixed focus job and the rear one is a 5MP with auto-focus and flash. Dell's spec sheets [http://www.dell.com/us/p/mobile-streak-7/pd] indicate that there will be 3G and non-3G versions of the Dell Streak 7, noting that "SMS & MMS [are] on 3G models only". Software-wise the Dell Streak 7 is already looking a bit dated: where rivals are shipping with Android 2.3, aka Gingerbread, or hanging on for the Android 3.0 Honeycomb release, Dell is sticking with Android 2.2, or Froyo. If you're thinking, "isn't that the version Google says isn't great for tablets?" you'd be right. It'll be interesting to see whether Dell's own Dell Stage software makes up for the comparatively old Android OS underneath. The Dell Streak 7 specifications make it clear that while the installed software will be Android 2.2, the Streak will have "over the air upgrade capability" - so you'll be able to move to a newer version of the OS. TMONews has found T-Mobile marketing materials suggesting a 2 February US release date for the Dell Streak 7, but the UK release date hasn't been announced (or leaked) yet. As with most tablets, we'd expect a UK release within a few months of the US version. There was much excitement recently when the same TMONews post quoted the Dell Streak 7 price as one payment of $82.50 and three monthly payments of $82.50, or $330 in total. T-Mobile has since contacted the site to say that isn't the price: the figures are the result of "a technical error". For the smaller 5" model, the UK Dell Streak price starts at £399 - so we'd expect the Dell Streak 7 price to be somewhere in the middle between that and the £600-odd people are currently paying for the Samsung Galaxy Tab.